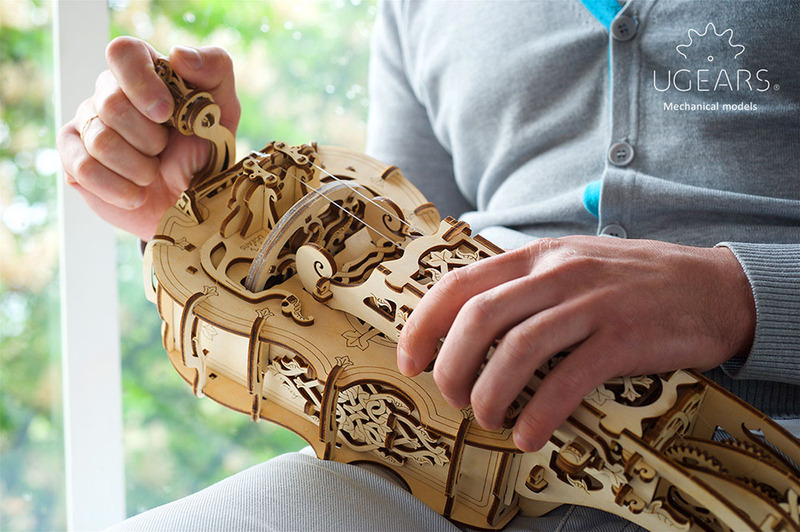 All-in-one: puzzle, toy and fully fledged musical instrument, UGEARS has just launched one of their most ambitious mechanical models yet—Hurdy-Gurdy, now on Kickstarter. Based on the obscure but beloved folk instrument which derives its sounds through a crank-driven wheel that rubs against strings like a violin, the UGEARS Hurdy-Gurdy is a DIY wood model that lets you construct and play it yourself. Inspired by the art of medieval craftsmen, the new model comes with everything needed for assembly including incredibly precise laser cut wood components, strings, and instructions. To help with easy assembly, the pieces are designed to lock together without the need for glue or adhesive while remaining fully mechanical. All UGEARS products are built from eco-friendly, sustainably sourced plywood. In addition to the instrument, UGEARS is offering a wide variety of additional models as part of their expanding Mechnical Town series that now includes a Tram Line Model, Rail Manipulator Model, a Robot Factory Model, and a number of smaller toys including a yet-to-be-announced “secret” model. The Hurdy-Gurdy model launches today and you can mix and match a variety of reward options right now on Kickstarter.